Those of you who have seen Pendragon, or indeed recent productions by Clive Nolan’s Caamora company, will already be familiar with Verity, who is an integral part of the company and one of the current backing vocalists for Pendragon. What you might not have realised is that as well as acting and doing backing vocals, Verity is a highly talented singer and songwriter in her own right, and this, her latest album released at the start of March, is the follow up to her highly acclaimed (and brilliant) debut of 2017, Breaking Out. 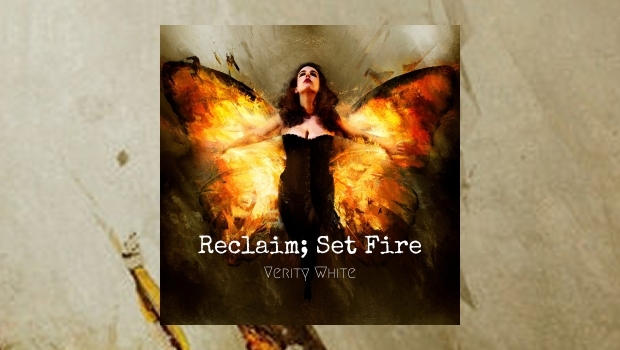 Having hit the road for some highly acclaimed gigs, where Verity has been described as a firecracker of a front woman, her latest album Reclaim; Set Fire is another incredibly powerful set of songs from this emotionally honest songwriter. The title is taken from the lyrics to Inside Your Love, an intense and honest expression of love to her husband, Alex White (whose guitar and bass work here is integral to the sound of the album) and as a musical duo they complement each other perfectly, Verity’s voice soars over some sublime guitar work. I find it fascinating to listen to music created by couples, there’s a spark, a connection that adds so much to the music, and it’s almost like the music develops organically. Verity is not afraid to wear her heart on her sleeve, and it’s her candid lyrics, her honesty and soul baring that make this album, you can tell she inhabits every word that she is singing and it’s this depth, this music from the soul that makes it such a fantastic album. The powerful vocals, and soul searching lyrics, accompanied by some fantastically sympathetic guitar work that underpins Wild, making it one of the most heart wrenchingly beautiful ballads I’ve heard for a long, long time. It takes a lot for me to stop and pause after listening to a song, but Wild just hits me somewhere deep, and that is the connection I want from an album. I have always been a fan of powerful female singer songwriters, ever since I discovered Under The Pink by Tori Amos back in the ’90s, and Verity is very much an essential part of the new wave of up and coming female artists, like Laura Kidd (She Makes War) Verity is doing it the independent way, treading her own musical journey, doing it her way, and being confident enough of her own abilities that she brings an audience along with her. Reclaim; Set Fire is a brave, bold, intense and emotional collection of tracks, mixing the personal with the powerful and reflecting on her own battles with mental health (the hard rocking, driving Listen Up! ), and indeed the pressures of social media (Come And Get It), the joys of live music (Turn This Up) and raw sexuality (the honest, Overload). The beautifully emotive closing piece Feel This takes you on a journey. It’s one hell of a roller coaster ride, with Verity’s amazingly powerful vocals, going from a growl to the far softer end of the spectrum, whilst the musical accompaniment by Alex White and Alex McIntosh is the perfect sonic canvas for Verity to create her art. As a performer Verity is engaging, honest and funny, and all facets of her personality come across on this album, which does everything it needs to do. Not one song outstays its welcome, and it’s as engaging, entertaining and honest as its creator, an absolute belter of an album.